Dental Implants Dominican Republic Source of Quality Dentistry. Oral Surgery & Periodontist in Santo Domingo, Dominican Republic. The Dominican Republic leader in implant placement and restorations. In Dental Implants Dominican Republic Source of Quality Dentistry is our main objective to return the smile to those patients in need of good quality dentistry, who cannot pay the expensive dentists in the United State and Canada. We are a team of friendly dentists who for more than 8 years have earned the trust of hundreds of patients from North America, and nowadays we are happy to be the dental clinic of their choice. Our services include Periodontics (the study of tooth structures, diseases, and conditions that affect them), Oral Surgery and Prosthodontics (also known as Dental Prosthetics or Prosthetic Dentistry). We offer high-quality dental service, the one patients expect and deserve, the implants and material we use are all recognized brands from the USA, we can provide brand's names so patients can make their own research and verify what we say here is right. We have been doing private adult dentistry for 10 years; we have placed around 800 dental implants and have done many updates implants courses, conference, some of them in the USA, we really care about our patient's health and before they come to our country or make any decision we always explain all the options and treatment alternative.We are professionals and we do not do business at the expense of patients. Without making any commitment we give a free consultation, patients can come to our office or send us x-rays, pictures or their local dentist treatment plan, so we can have a better idea of their case, that way we will provide a diagnosis and treatment plan, cost and time needed for the procedure, everything patients need to know before coming to our dental clinic in Santo Domingo, Dominican Republic. Patients can fill our contact form with all their information, phone number and the best time to call, and we will be in touch as soon as possible. Related topics to Dental Implants in the Dominican Republic. 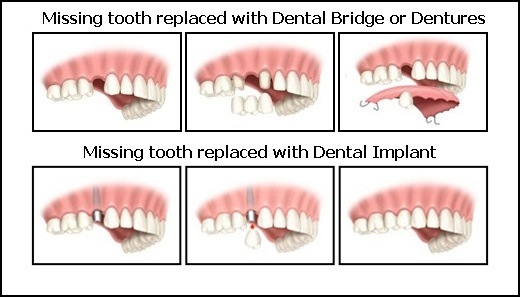 Dental implants are prostheses that are placed (implanted) in the mandibular or maxillary bone, creating a solid foundation on which you can perform both single tooth restorations(dental crowns) including partial(Dental bridge) or total prosthesis(dentures), and work just like our natural teeth. Dental Implants are titanium screws, which is the material that best meets over the years. Studies for over 15 years that show how titanium implants prostheses are stable over time. All this makes titanium our material of choice. It has been scientifically demonstrated that titanium implants can integrate with living bone with a high degree of predictability, and without inflammation of the soft tissues surrounding it. This intimate union of bone cells to the titanium surface is what is called Osseo Integration (bone accept titanium as if was part of the body’s own structure, thus producing a biological weld and grow around it). Dental implants allow us to chew with total comfort, smile and talk to the same security as our own teeth. In this sense, it is important to understand that an implant is nothing more than an artificial root. They are useful in terms of offering support to the prosthesis in all its types. 1.- Replace dentures (removable) for fixed teeth, improving the function and simultaneously serve as an anchor for this type of dentures, increasing the stability. 2.- To replace teeth without touching the natural teeth, allowing us to chew with total comfort, smile and talk with confidence. 3.- Stop bone resorption; In the jaws after a tooth extraction, the bone begins to lose over time as a natural process. Implants placement and the stimulus of mastication can create an osteocondensation or ossification process around the implants, stopping bone resorption and may even induce the formation of bone around them. Periodontist | Oral Surgery | Dental Implant | Santo Domingo, Dominican Republic | Dental Implants Dominican Republic S.Q.D.